Chatham developed around an important naval dockyard on the east bank of the River Medway. It is also the home of the Royal School of Military Engineering. 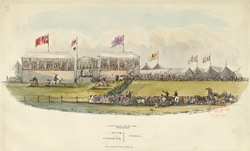 As an important naval and military town, near the historic town of Rochester, it attracted great numbers of the professional classes to weekend balls and races such as this one.